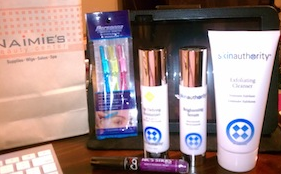 Today I went to the Skin Authority (SA) skin care event at Naimie’s, where licensed esthetician and SA rep, Nazeli Pogosyan, provided free facials and product education. 1. 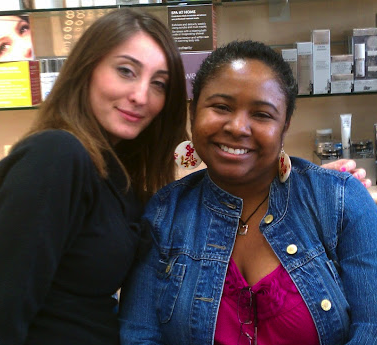 )Nazeli was extremely knowledgable about skin care and the Skin Authority product line. She had so much information to give, that it was almost overwhelming. 2. )Nazeli was also very personable and took the time to explain things in a way that was easy for me to understand. 3. )Plus, there was no hard sell. Nazeli never said “If you don’t use this product, your skin will fall off and die!” She was more concerned with stressing education. Things like always using a daytime moisturizer with SPF, no matter what brand I picked. I like that! Their Wrinkle Reversing Serum was incredible! I was told it plumps out fine lines, smooths the skin tone and firms the skin. My face did feel a bit plumper and a bit tighter. But most importantly (to me anyway), when she put the serum on half my face. Then she showed me a mirror. The side with the serum was instantly a shade lighter and brighter! Gotta get me some of that! 1.) You need to exfoliate daily. Otherwise you are putting moisturizer and other products on top of dead skin. Which creates patches of dry flaky skin and other unsightly facial issue (GROSS!). 2. )You gotta use a daytime moisturizer with SPF (even if you are black like me). Especially if you are using something to eliminate dark spots, SPF will save you from getting additional dark spots, and from more horrible things like skin cancer. 3.) 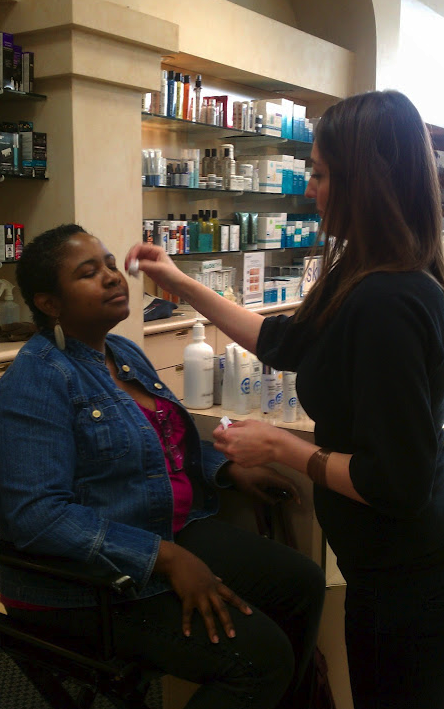 Skin Authority doesn’t use any parabens, dyes, fragrances, or animal testing. There is some debate over whether or not parabens causes cancer, so I figure it’s best to err on the side of caution. My face felt so good after the facial I had to try the products. Plus a few other non-related things. After the facial I bought their Exfoliating Cleanser, Brightening Serum (remember obsession with dark spots) and Age Defying Moisturizer. Since I get a pro discount and had my gift card I didn’t have to pay anything for the skin care, so I decided to get a new nail polish and eyebrow shaper. I will have to wait until next payday to get their Wrinkle Reversing Serum. Today was GOOD day! Nazeli is definitely someone I would like to talk to again because of her personality and skin care knowledge. She gave me so much information about the SA brand that I couldn’t fit it all into one blog. I will definitely be talking about this brand again. Especially when I go back for the Wrinkle Reversing Serum. Yep, it's me with no makeup on. My skin felt so good after the mini facial, thanks to Nazeli and Skin Authority!